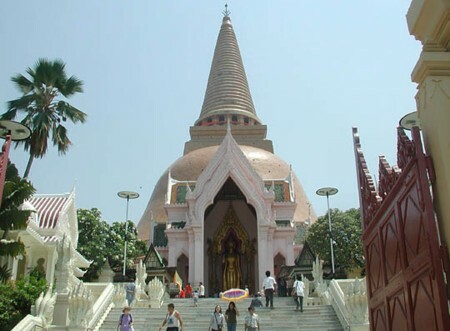 The Phra Pathom Chedi located at Nakhon Pathom city is the world's tallest Buddhist monument, at 114 meters (380 feet). The orange-tiled chedi dates back from the mid-1850s. The north 'viharn', or shrine, houses a standing Buddha statue. The base of the statue contains the ashes of King Rama VI of the Chakri dynasty (the present Thai dynasty). There is a big Buddha in front of the chedi. The reclining Buddha is inside the temple.